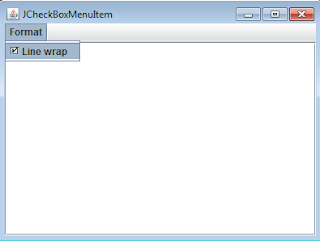 JCheckBoxMenuItem component can used to implement check boxes as the menu items. You can select many checkbox menu items. When you select a check box, menu item displays a check mark. Deselecting the item clears the check mark. Like a menu item, checkbox menu item can display text, icon, and both. Below are constructors that can be used to create a checkbox menu item. creates a checkbox menu item without text or icon. creates a checkbox menu item that its properties are taken from the Action object. creates a checkbox menu item with the specified icon. creates a checkbox menu item with the specified text. creates a checkbox menu item with the specified text and selection state. creates a checkbox menu item with the specified text and icon. creates check menu item with the specified text, icon, and selection state. In the example program below, a menu bar is created using the JMenuBar class. On this menu bar, we place a menu called Format. In the menu Format, there is one checkbox menu item. When the user select this checkbox menu item, the text in the JTextArea will be wrapped. Das Kontrollieren des Kästchens kann ein Problem sein. Wenn du willst, kannst du das machen, ich betway wetten und sie werden dich nicht um eine einzige Frage bitten. Ich habe es ausprobiert und es hat bei mir so oft mit Sicherheit funktioniert.